This article is about the "European" blueberry. For the "American" blueberry, see Blueberry. For other uses, see Bilberry (disambiguation). ^ "Bilberry". Merriam-Webster Dictionary. Merriam-Webster, Incorporated. 2016. Retrieved 1 January 2017. ^ a b Blamey, M.; Fitter, R.; Fitter, A (2003). Wildflowers of Britain and Ireland: The Complete Guide to the British and Irish Flora. London: A & C Black. p. 106. ISBN 978-1408179505. ^ Voss, E.G. (1996). Michigan Flora Part III Dicots Concluded. Cranbrook Institute of Science. p. 46. ISBN 1877370401. ^ a b Burdulis, D.; Ivanauskas, L.; Dirse, V.; Kazlauskas, S.; Razukas, A. (2007). "Study of diversity of anthocyanin composition in bilberry (Vaccinium myrtillus L.) fruits" (PDF). Medicina (Kaunas). 43 (12): 971–7. PMID 18182842. ^ Lätti, A.K. ; Riihinen, K.R. ; Kainulainen, P.S. (2008). "Analysis of anthocyanin variation in wild populations of bilberry (Vaccinium myrtillus L.) in Finland". Journal of Agricultural and Food Chemistry. 56 (1): 190–6. doi:10.1021/jf072857m. PMID 18072741. ^ a b Edgar, Julie (2015). 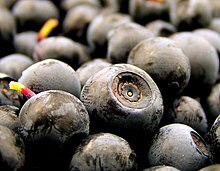 "Bilberry extract and vision". WebMD. Retrieved 26 January 2018. ^ Canter, Peter H; Ernst, Edzard (2004). "Anthocyanosides of Vaccinium myrtillus (Bilberry) for Night Vision—A Systematic Review of Placebo-Controlled Trials". Survey of Ophthalmology. 49 (1): 38–50. doi:10.1016/j.survophthal.2003.10.006. ISSN 0039-6257. ^ "Bilberry". National Center for Complementary and Integrative Health, US National Institutes of Health. September 2016. Retrieved 26 January 2018. ^ "Phytophthora". Natural England. Archived from the original on 27 March 2012. Retrieved 26 June 2011. ^ "Disease of Bilberry (Phytophthora)". Staffordshire County Council. Retrieved 26 January 2018. 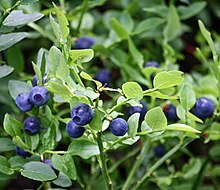 Wikimedia Commons has media related to Bilberry. Wikisource has the text of the 1911 Encyclopædia Britannica article Bilberry.